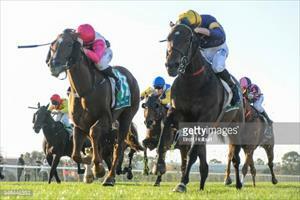 Grand Teton showed plenty of fight to win his third race at Geelong on Thursday. Stephen Brown was able to get across the field and ride the speed and Grand Teton was brave in the home straight to repel the challenge of La Rita, to whom he was conceding six kilograms, and win the Benchmark 58 Handicap over 1600m by a head. Mike Moroney was impressed by the horse and rider. “It was a good, tough win and a good ride from Stephen,” Moroney said. “He got him wound up before the home turn knowing he’d need all of the 1600m and after pinching a break on them, the horse held on really well. Grand Teton will now be available for sale through the Inglis Online April Auction. “He’s still got some upside but we’ve added to the stable with new yearlings so it gives someone a chance to buy a nice horse,” Moroney said. “I do think there are more wins still in the horse and he has not been given a hard time with us so I’d say someone is going to have a lot of fun with him.